As we all know, Sharknado is one of Syfy's bigger hokey movie hits that they have ever seen. Hokey, as in B-Movie fun, from, of all places, The Asylum. With Sharknado 3 coming up on July 22nd, there's more to this premiere than meets the eye, or television schedule. In fact, starting July 18th, Syfy will be hosting the second annual Sharknado programming week. I know, exciting, isn't it? 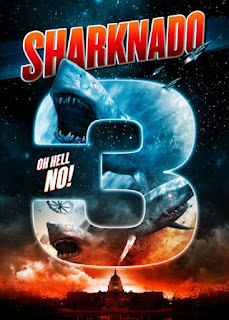 –Sharknado 3: Oh Hell No! –The world premiere of Lavalantula, starring Steve Guttenberg and fellow Police Academy alums Leslie Easterbrook and Michael Winslow, as they battle lava-breathing tarantulas threatening to destroy Los Angeles.